Cedars of Lebanon State Park came about as a result of the Workers Progress Administration, or WPA, which was established in 1935 by President Franklin Roosevelt to help provide economic relief to the citizens of the United States who were suffering through the Great Depression. Cedars of Lebanon State Park and Forest were created as a reclamation project of some 9,000 acres of land in Wilson County, an area plagued with barren land unsuitable for crops and previously deforested. In the mid 1930’s, lands were purchased and combined into a single area for the purpose of replanting the Eastern red cedars which had been logged for use in the pencil industry. The land was purchased from 60 local farmers, some of whom were resettled. Jobs were created for 300 employees. They replanted trees and developed the park for recreation and conservation. Cedars of Lebanon State Park and State Forest are home to 19 rare and endemic species of wildflowers that are found only in the cedar glade environment. With over 9,000 acres, the park and forest offer outdoor enthusiasts, hikers, and campers many educational and recreational opportunities. 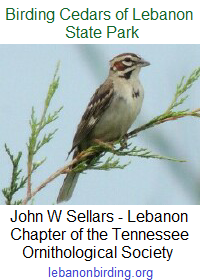 Cedars of Lebanon State Park has 8 miles of hiking trails ranging from easy to moderate. Named for the cedars that existed in the Biblical lands of Lebanon, Cedars of Lebanon State Park and State Forest are home to the largest remaining stand of red cedars in the United States. Although not true cedars, the Eastern red cedar (Juniperus virginiana) is a close cousin.